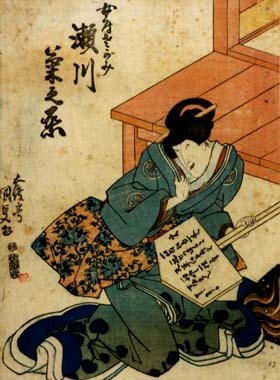 The play "Ichi-no-Tani Futaba Gunki" (five acts) was originally written for the puppet theater and staged for the first time in Ôsaka at the Toyotakeza in the 12th lunar month of 1751. It was adapted for Kabuki the following year and staged for the first time in Edo at the Moritaza in the 4th lunar month of 1752 [casting]. It was also performed for the first time in Ôsaka in the 11th lunar month of 1752 at the Naka no Shibai as a kaomise drama [casting]. Structure The "Kumagai Jin'ya" scene, which is nowadays the most frequently performed one, is the final scene (kiri) of act III. Fuji-no-Kata was a lady-in-waiting to the Emperor who was a supporter of the Heike clan. She had, among her ladies, one named Sagami. Sagami fell in love with the Genji warrior Kumagai. For a lady of the court to take a lover was an offense punishable by death. To make matters worse, Kumagai was working for the rival clan. Sagami was already with child, but her mistress, Fuji-no-Kata, took pity on her. With her help the pair were able to flee to Western Japan. Fuji-no-Kata was also at that time pregnant, by the Emperor. She was married shortly afterwards to Taira no Tsunemori, one of the Heike clan, and her child, Atsumori, was brought up as Tsunemori's son. Sixteen years later, destiny brings Kumagai and Atsumori together on the battle field as mortal enemies. In consideration of his debt to Fuji-no-Kata and because of Atsumori's Imperial blood, however, Kumagai cannot bring himself to kill the boy. He decides instead to sacrifice his own son Kojirô in place of Atsumori. Later Atsumori's and Kojirô's mothers encounter each other at Kumagai's camp. They both realize everything when they see the human head Kumagai is preparing to show General Yoshitsune (1159-1189), the half-brother of Shôgun Yoritomo (1147-1199). It is supposed to be the late Atsumori's. Fuji no Kata has mixed feelings of joy for her son's safety and sympathy for the poor Kojirô. Now sorrow is transferred from Fuji-no-Kata to Sagami. They are interrupted by the sudden entrance of Kajiwara Kagetoki. Aware of what is going on, he threatens to expose the deception to Yoritomo. Yoshitsune, he says, has shut his eyes to Kumagai's plot, but Yoritomo will never permit the fake. Kajiwara goes off the stage in a full rage. A moment later, a scream is heard. 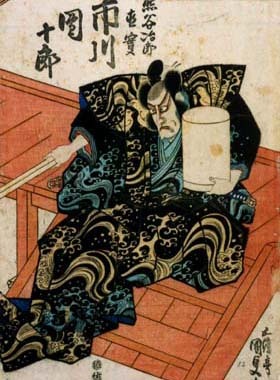 Midaroku has killed Kagetoki to spare Yoshitsune the trouble of sullying his hands. This is because he is on Genji's side deep in his heart. When Midaroku is about to go on his way Yoshitsune stops him, calling him "Munekiyo". At first Midaroku pretends he does not know to whom Yoshitsune is speaking. Then the Genji general relates how the great Heike warrior Munekiyo saved the lives of his mother, his brother, and himself when they were caught by the Taira clan. Midaroku admits that he is indeed Munekiyo. It is in an attempt to atone for his fault in sparing the lives of those destined to become the instrument of the Heike's downfall, that he gave up being a samurai and devoted himself to caring for the Heike dead. He says if he had not saved them, Shôgun Yoritomo, the head of the Genji family, would not have seen the light of day. Yoshitsune does not resent his words. On the contrary, he intends to help smuggle Atsumori out of Kumagai's camp in return. He, therefore, orders a large case, ostensibly containing armor, but in which Atsumori is hidden, to be brought and presented to Midaroku. In the meantime, Kumagai returns. The shock of his terrible sacrifice to duty and honor makes it impossible for him to continue being a samurai. Now all he wishes to do is to spend the rest of his life praying for the release of his son's spirit. Yoshitsune, deeply grieving, grants his request. From the depth of his sorrow Kumagai cries, "Sixteen years for my son have passed like the dew. It was a dream. Oh, it was merely a dream!" The role of the warrior Kumagai Jirô Naozane is one of the greatest tachiyaku roles of the current repertoire. It is usually performed by high-skilled and experienced actors like Nakamura Kichiemon, Matsumoto Kôshirô, Ichikawa Danjûrô or Kataoka Nizaemon.